I don’t know about your part of the world, but here in Iowa, the weather has been amahhh-zing. It could not be more beautiful! Waking up to the birds chirping and a slight breeze blowing in the window? Let’s just say that magical springtime feeling (paired with a cup of black coffee) is just the thing I need to give me a little boost in the morning. Some days, I’m even inspired to actually do my hair and put some pants on! But let’s get to the point, shall we?! 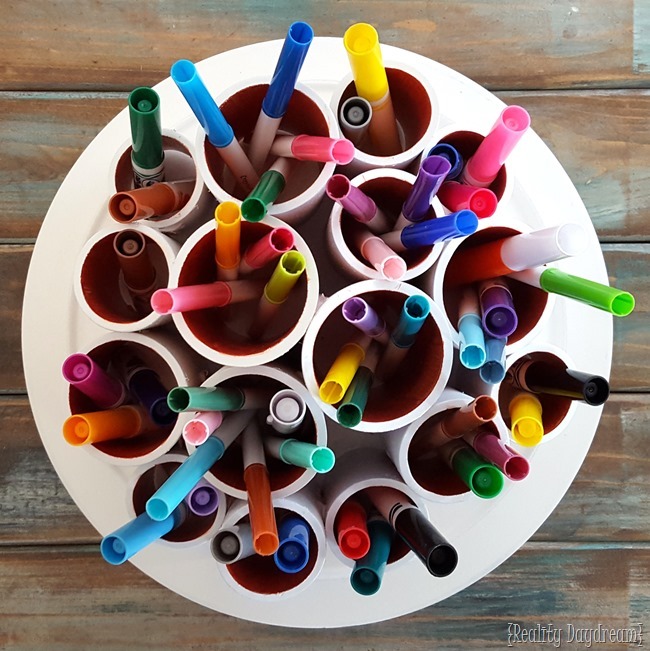 Today, I bring you instructions on how to make this darling Lazy-Susan Marker Caddy for that creative tot in your life! This post contains affiliate links for your convenience. Please see my disclosure policy for details. 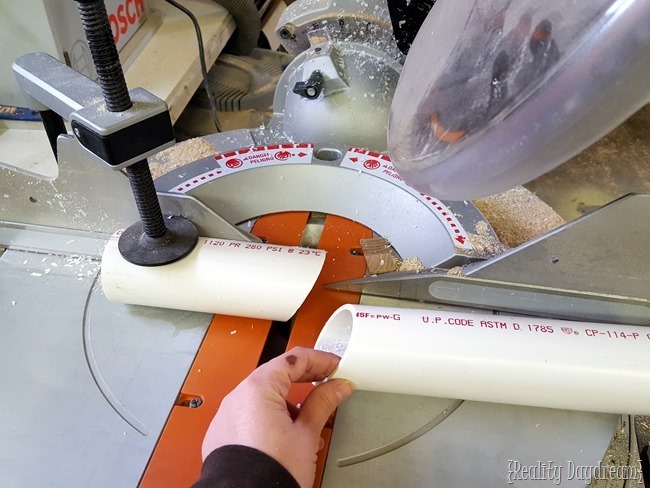 I started out by chopping the PVC pipes at various angles using my Miter Saw, and made sure I was cutting them into a variety of lengths. You don’t need a special blade for this. It cuts like buttah! Then, I sanded the edges and wiped them down with soapy water. After letting them dry thoroughly, I set them up on the lazy-susan and arranged them just how I wanted them and began gluing them together. 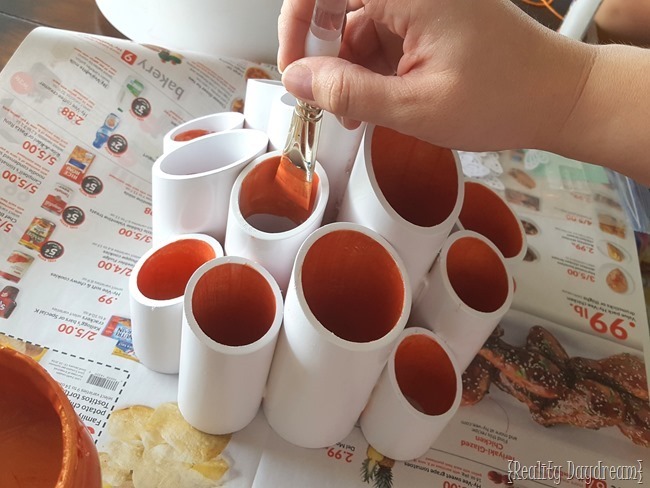 I started by gluing 3 of them together and letting them dry a bit so they were pretty secure, and then I continued gluing each additional piece to that trio. After letting the glue dry overnight, my chunk of PVC pipes were SOLID! I spray painted them glossy white… because it’s paint and primer in one! Then once that spray paint was dry, I brushed on some shimmery orange craft paint on the inside for a little added flare. You could do a different color in each tube if you wanted! But since I knew I was going to store colorful markers in here, I wanted to keep it all one color so it wouldn’t get too busy. Finally, I glued the whole thing down to ma already-painted lazy susan! It was so fun letting the girls fill it up with their markers. They love to color, and spend HOURS each day making their masterpieces. Which brings me to this question… WHAT DO YOU DO WITH ALL YOUR KID’S ARTWORK?! I keep my favorites, but even those add up to a huuuuge stack by the end of each week. Please don’t make me rent a storage unit! P.S! 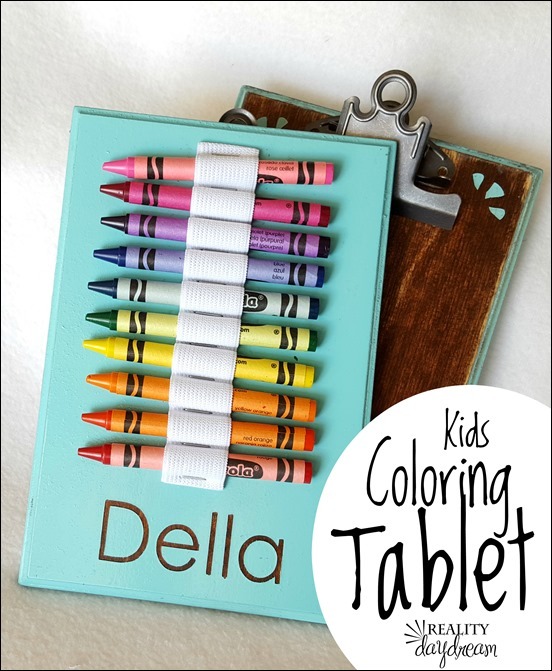 You might also enjoy these DIY Coloring Tablets! My girls use them every single time we drive anywhere! Not exaggerating! 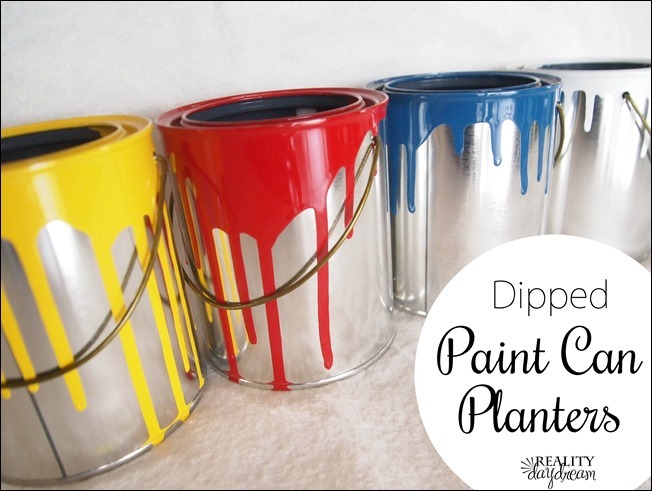 And these Dipped Paint Cans can be used as planters, or to store art supplies, paint brushes, etc! 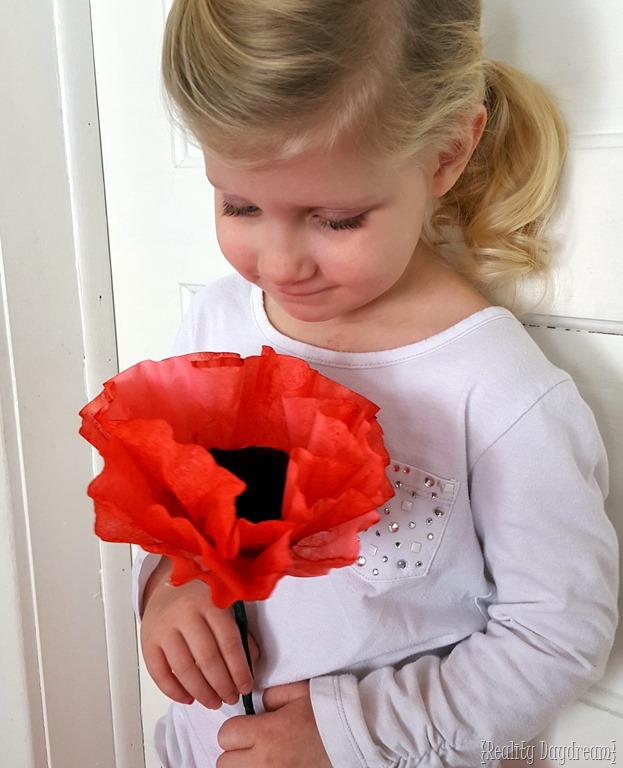 AND they’re a really fun project to do with your kiddos! My mom kept the best pieces in a box and then gave those boxes to us when we got older. By best I mean worst, funniest, and weirdest, in addition to the actual good works. I open that box from time to time and get a good laugh at my Very odd collection. She also put our report cards in there along with notes teachers sent home, and awards and ribbons we received. I saved some of my kids artwork, put a date in a corner. I kept them together with heavy clips then after the clip got full I made a book for each one. They are older now and love to look back at their art. Awesome idea! 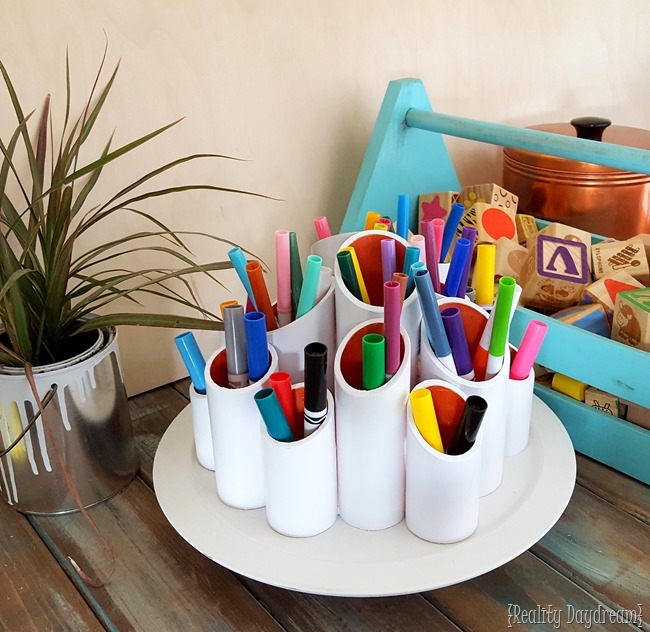 Sense I’m an incrediblty frugal crafter who prefers to upcycle items instead of tossing them, I replicated your pvc pipe caddy with toilet paper rolls and a dollar store lazy susan and my trusty hour glue gun. After wrapping the tubes with dollar store shelf liner paper, it’s just as cute and I didn’t have to bust out any paint (I’m also incredibly clumsy/messy). Total cost, $2. Thank you so so much for the inspiration! 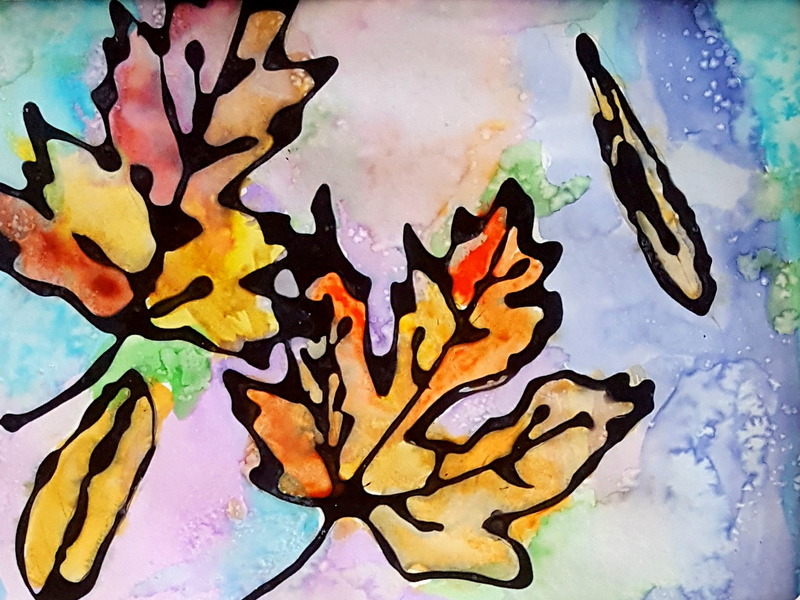 How about taking a photo of each piece of art and turning them into a screen saver on your computer….just an idea. I do love that idea! It would be like a slideshow when your computer is ‘sleeping’! This is a great idea! It appears the links for the sizes of the PVC are the same. What other size did you use besides 1 1/2″? Oh sorry! The other size is 2″! I hope you’ll pick up some new interest from my readers! Do you think you could use a hacksaw to cut the PVC pipes? Too cute!!! I love this idea! I’m slowly reorganizing our playroom and this would be a great idea to incorporate now that the kids aren’t trying to eat crayons or markers. PINNING! That’s a decent idea Gramps. oh for the masses of drawings – take pictures & save to a jump drive for each kiddo. It would be fun to have one of those digital photo frames too, to display them. LOVE IT! EXCELLENT IDEA!!!!!! 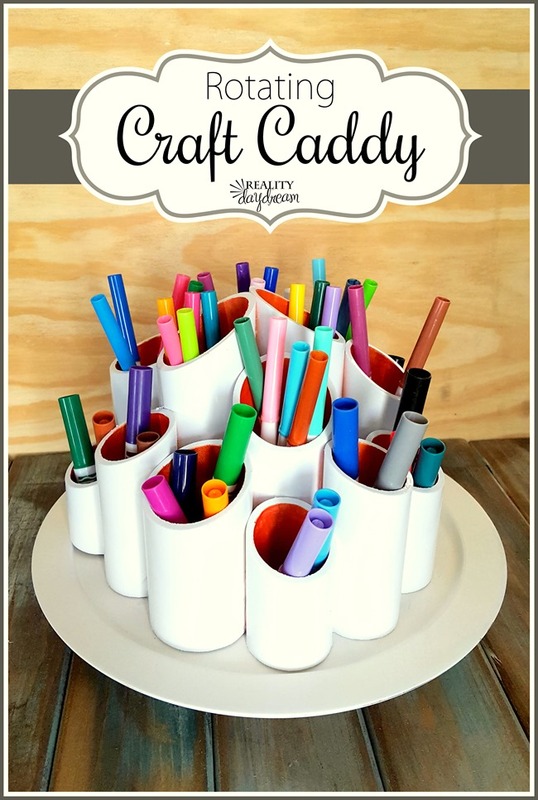 Never seem to find a caddy that’s big enough to hold all the markers/pens/pencils (even an excellent idea for a kitchen utencil caddy) or to hold an array of candies…. right.. as if candy lasts that long around me . That’s a great idea to put all of the kid’s crayons, markers, etc. on a lazy susan. As for what I do with the kids artwork, I keep holiday things and store them with holiday decorations for now. As for regular, everyday artwork, things I really like go on to/become a part of our artwork curtain. On the door that leads to our front porch I put up a curtain rod and then used the clip curtain rings to hand several pieces of artwork down from. 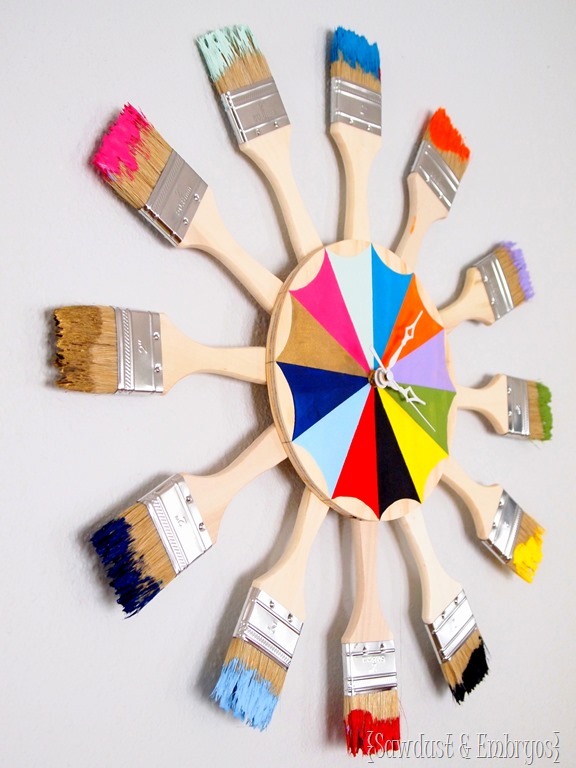 It is a rotating and fun way of displaying the kids art work. That looks so neat and pretty. 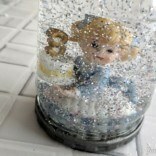 I bet it would also make a great center piece with some silk flowers. Looks gorgeous and I’m sure your girls are loving it! We don’t have kids yet…but our plan is to scan the favorites (along with report cards and other kid memorabilia) and make yearly Photobooks.